via iPhone Tops Sales Charts at Each of Its U.S. Carriers – John Paczkowski – Mobile – AllThingsD. That’s useful data. Mainly because we can use it in combination with comScore data that tracks a different market measure. comScore’s MobiLens service tracks US mobile installed base. By measuring the difference between their stats one month to the next, one can measure the gain in a particular platform. Comparing that gain with the sell-through rate in the same period can yield a figure for the number of units sold as upgrades vs. those sold to new users. The latest comScore data (period ending February) shows that Android added 2.87 million users to its base while iPhone added 1.52 million. If we assume that Android sold a minimal number of replacements (due to the limited time in use of bulk of units) and round up to 3 million for February, and if we assume that Apple sells as many iPhones as Android (which is what Walkley suggests) then we can conclude that in the US roughly half the iPhones are bought as replacements for existing iPhones. Extrapolating this to global markets may be risky but already we can begin to form a picture of how the iPhone franchise is becoming an annuity-based business. Apple likes to point out that “half of Mac buyers are first time buyers.” In the case of the iPhone perhaps they could also say “half of iPhone buyers are repeat customers.” At this stage in the platform, that’s a powerful statement. If the repeat customer rate is high then it suggests strong loyalty but it also may suggest poor competitive position vs. non-consumption or alternate platforms. If the repeat customer rate is very low it may suggest competition vs. non-consumption but it may also suggest low loyalty. It all depends on the overall growth in the market and size of installed base. The following chart shows the overall market growth and the position of the various platforms within that growth. Note the time scale is slightly more than two years. 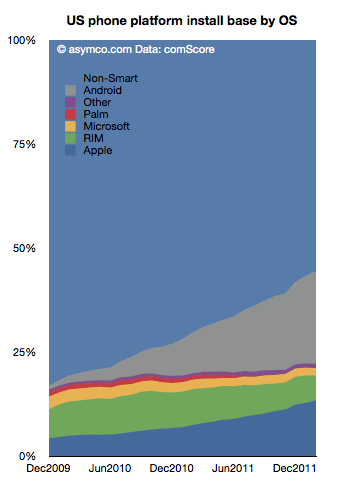 This suggests that the vast bulk of Android units in use (grey area) consists of first use units. New purchases are going to first time buyers. In contrast, the shrinking RIM total implies extremely low sales as the age of the base is far older than the time scale. 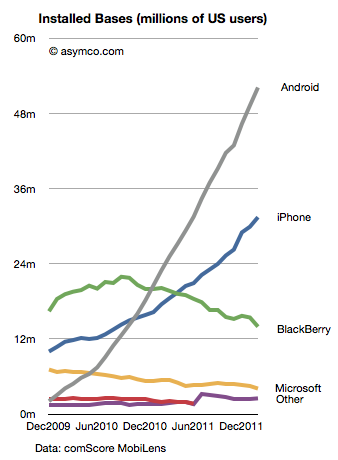 iPhone base is both growing and being upgraded. As we reach 50% penetration of smartphones, platform churn will become a significant component of market performance. The loyalty and “stickiness” of Android will begin to be tested. Current surveys show reasonably good satisfaction ratings for Android phones (around 60%) while iPhone’s are even higher. But let’s keep in mind that RIM’s satisfaction and the loyalty of their customers was exceptionally high a few years ago. The rate of evaporation of goodwill toward the brand is breathtaking. So far, the iPhone seems to be getting a passing grade while Android has yet to face the test.